This tree was looking pretty good last August but I am hoping it will be looking even better by the end of this year. But before that it will have to look like crap. 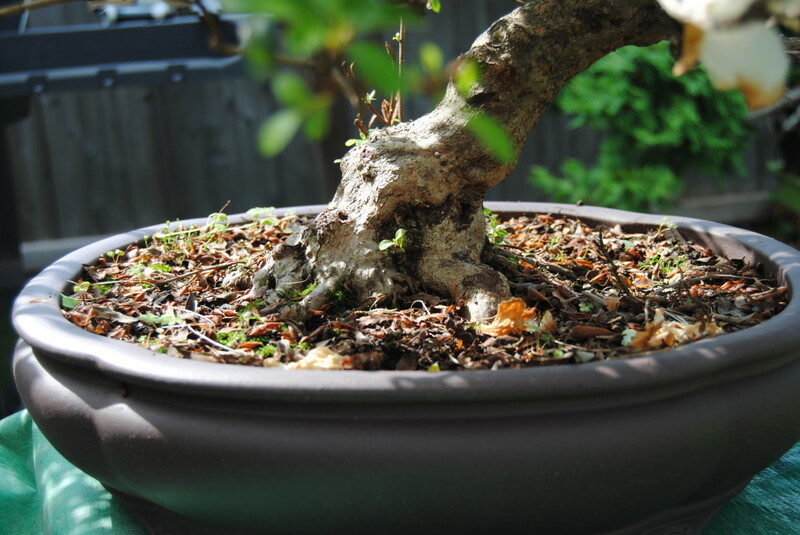 It was finally repotted this spring into its first bonsai pot, some five years after collection. I am not completely happy with the planting angle nor the positioning in the pot, but that was the best I could do given the placement of the roots. The quality of the pot is not ideal either, but a comparable high quality container would be very, very expensive. If I could even find one. I am thinking about ideas for a custom made container in the future. it is impossible to cut off wire that is biting into a branch without severely damaging that branch. You have to unwrap it. The exception is very thick work-hardened copper wire which can be very difficult to unwrap without twisting the branches. I usually cut that off if possible. The tree was also thinned quite drastically. This will simplify the upcoming wiring process and also improve the branch structure. And for the first time, the deadwood was properly cleaned and some old dead stumps were refined. It was also treated with a 50% dilution of lime sulfur. It is now resting for a couple of weeks then it will be wired. 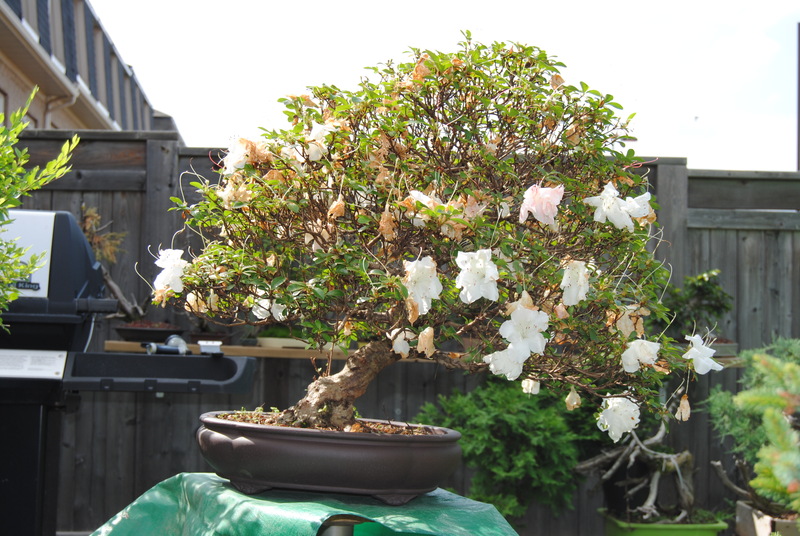 I acquired this “Kinsai” satsuki azalea in March 2014 from the Kennett Collection Reduction Sale. 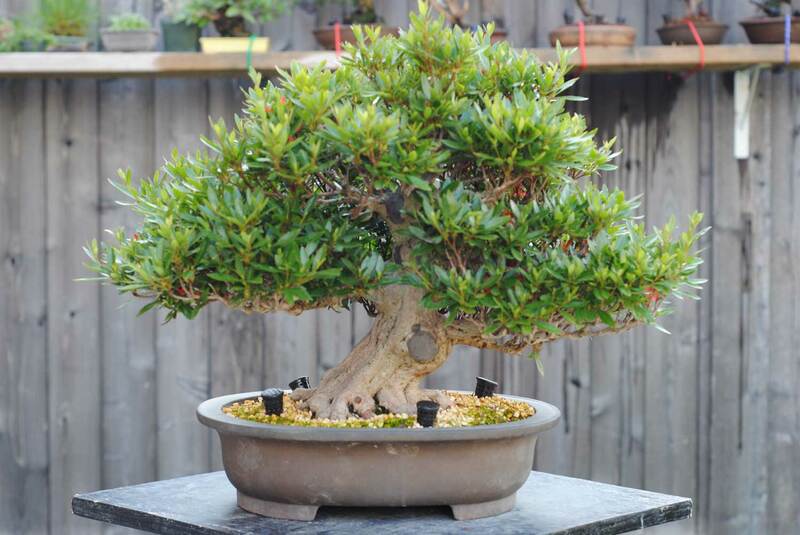 This event was the most significant bonsai sale in North American history and probably one of the most significant outside of Asia. According to a Facebook post by Doug Paul, owner of the Kennett Collection, “all the Satsuki’s were purchased from Kobayashi San in Kanuma City”. 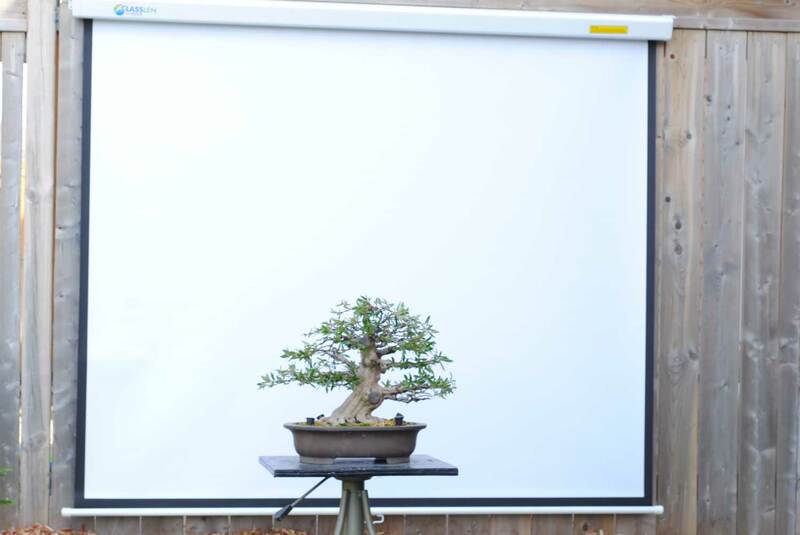 At first I thought this was referring to contemporary bonsai master Kunio Kobayashi, but I’ve since learned it is referring to Kobayashi Sangyo Co. Ltd. which is a wholesaler, producer, and exporter of satsuki azaleas. While this tree has an awesome trunk and nebari, it still needs years of work before it reaches its peak. It has a number of significant wounds that, while not overly large, had not been treated with much care – probably because it was grown for wholesale purposes. Also, it seems that detailed branch thinning hasn’t been done for years. As a result, the ramification was overly dense in need of major work. Last year it was only repotted, watered, fertilized, and flower buds were removed in order to build up strength. The wounds were also carved back and sealed so they can continue to heal over. 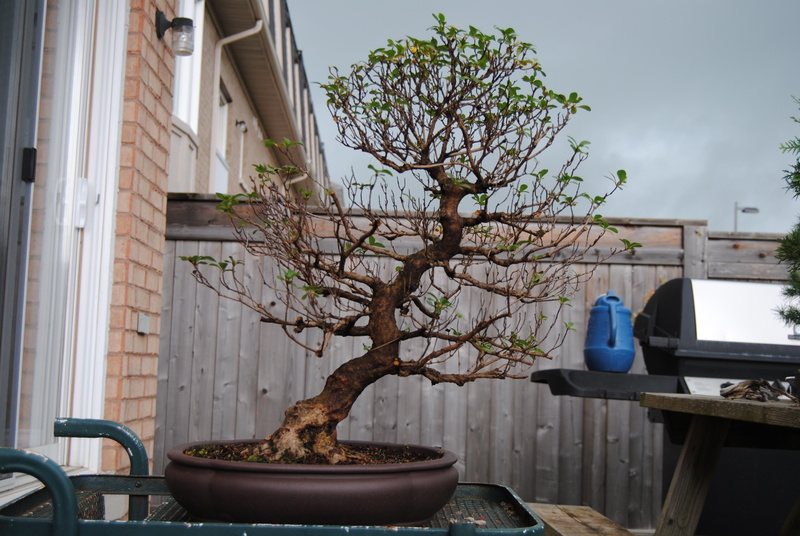 This year it was lightly repotted again and after seeing that it was extremely vigorous, I set about drastically thinning the tree and doing some structural wiring. I am relatively new to satsuki bonsai, but I know by now that they are incredibly dense growers and it seems that drastic thinning work like this will be necessary every 10 or so years, as is the case with most trees. Before any work. Even though I plucked the flower buds last summer I still missed a couple dozen. None of the satsuki at the sale had labels therefore I was delighted to learn it was a kinsai when it first flowered some 3 months after purchase. The spidery scarlet flowers are certainly unique. 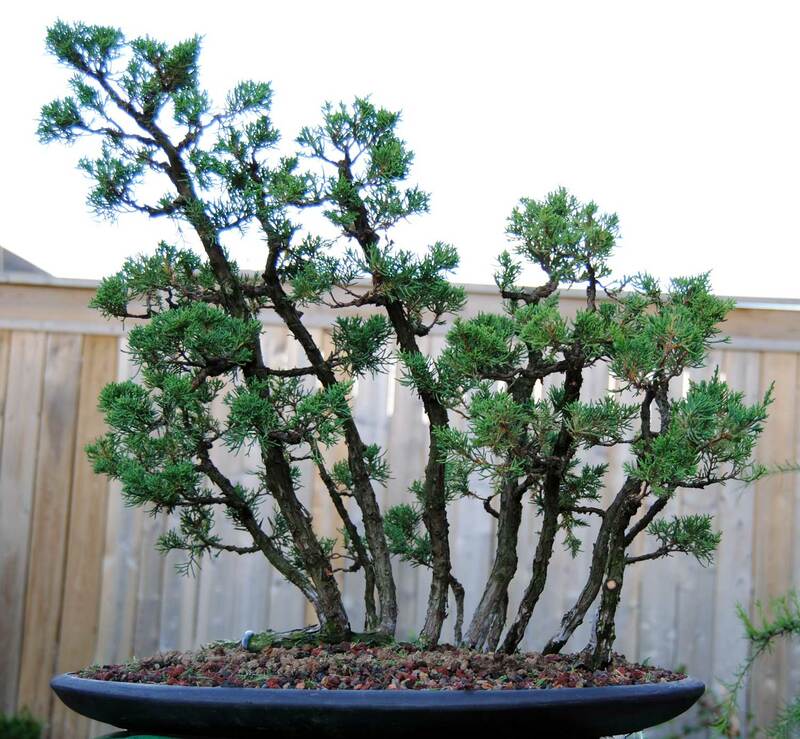 Kinsai is also known for small leaves and a slightly reddish bark colour and winter foliage. 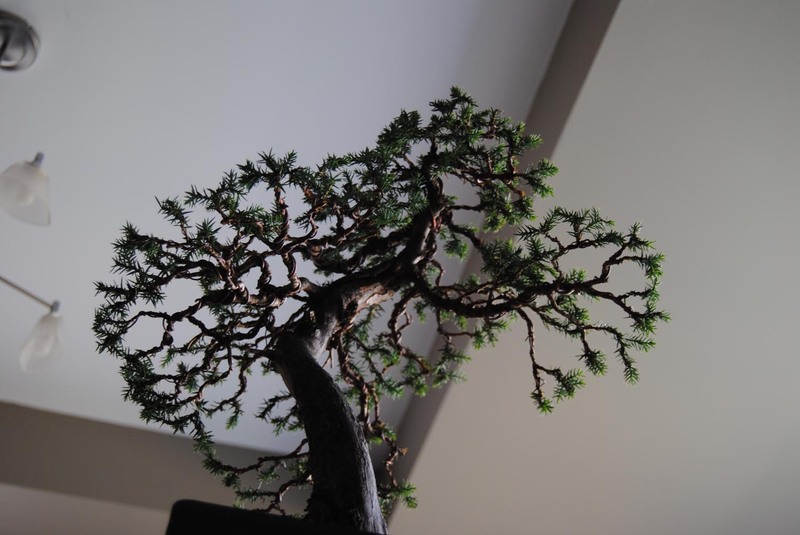 A main branch after thinning and wiring. New growth should explode all along these branches in a few weeks. Then it can be maintained for a few years with diligent thinning and much less wiring. At least that is the plan. About halfway done. The idea is to make tiers of foliage which will produce tiers of flowers. All done and photographed in front of my new backdrop. This certainly makes it hard to hide any faults of the tree. Clearly the first branch on the left needs to be shortened but that will happen after the new buds appear. I am also considering removing or layering that lowest back branch poking out on the right. The backdrop is just a roll up projector screen which I can hang on my fence. This makes it much easier for me to photograph my larger trees (of which I have more every year, it seems). Having it mounted outside also allows me to take advantage of natural light which I find makes taking decent pictures much easier, especially since I have a pretty crappy camera. March 2014, as purchased and in front of my old backdrop aka the wall in my kitchen. My yard is all cleaned up and the trees are tucked away for winter. I thought some of my readers might be interested in seeing what my tiny yard looks like when the trees are packed away. 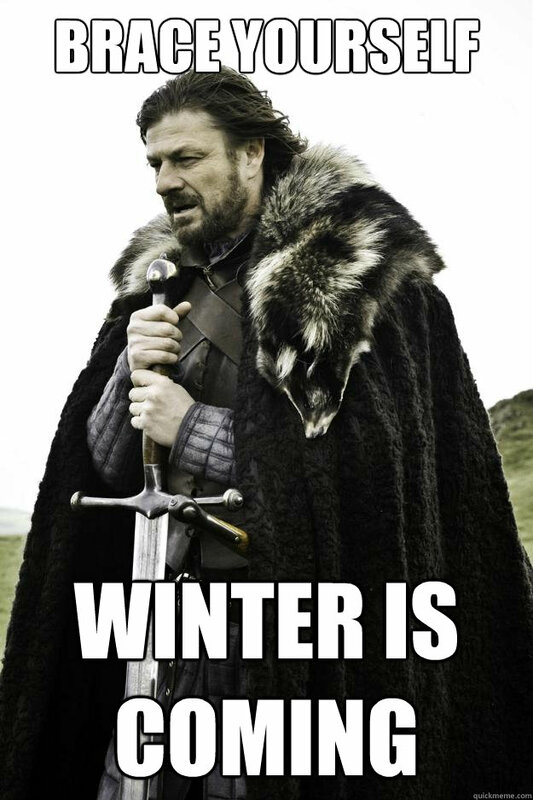 I wrote about my overwintering strategy last year, if you are interested. This is where I overwinter most of my smaller trees. There are 24 trees tucked away in there in this picture. A 1/4″ hardware cloth fence has since gone up. Most are buried to the rim of the pot, but many are just sitting on the soil with mulch tossed on top. As you can probably tell, this year I got a sweet deal on clearance red cedar mulch. Not pretty but effective. This side is where most of my large collected stuff goes. 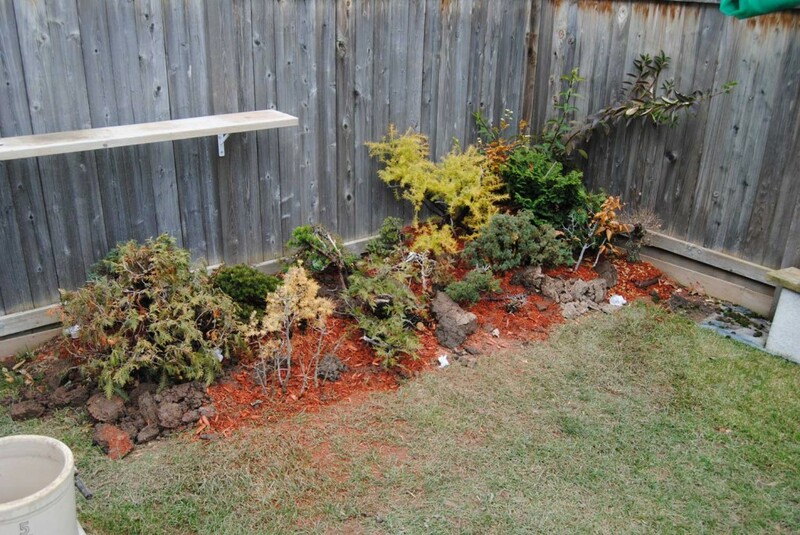 Cedar, larch, and rocky mountain juniper, all of which are just fine sitting on the ground for the winter. Burying the big training boxes would be impractical. I cover the soil surface in mulch mostly for moisture retention. Off to the right are some trees that were collected this fall. They are in a somewhat protected corner and are more heavily mulched in around all sides of the boxes. 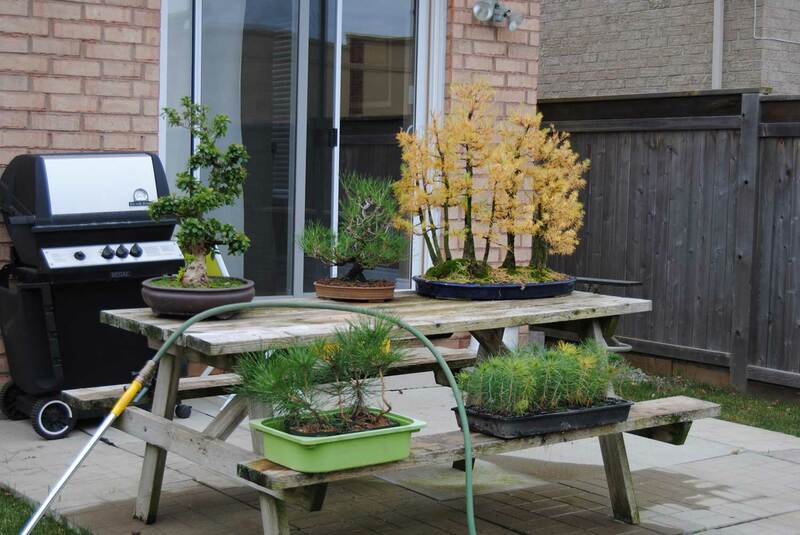 Here are some Japanese Black Pines and an Azalea which will be spending the winter in the garage when it gets really cold. They can tolerate some heavy frosts no problem. In fact, this azalea saw -12 Celsius in its cold frame one year according to its previous owner! The larch forest will sit right there all winter. 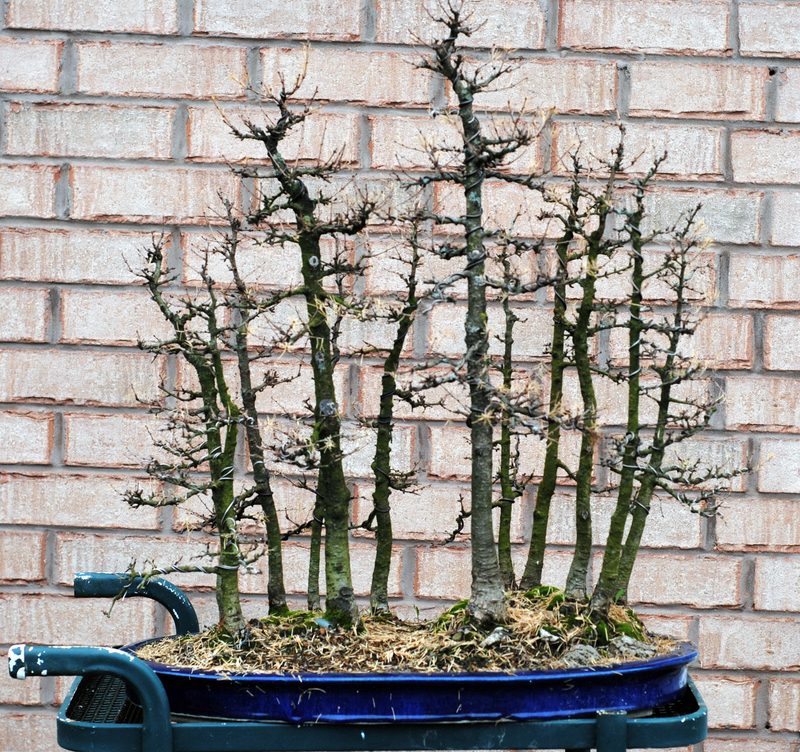 I’m always telling people how winter hardy larch are but I’ve never actually left one out on the bench all winter. First time for everything! 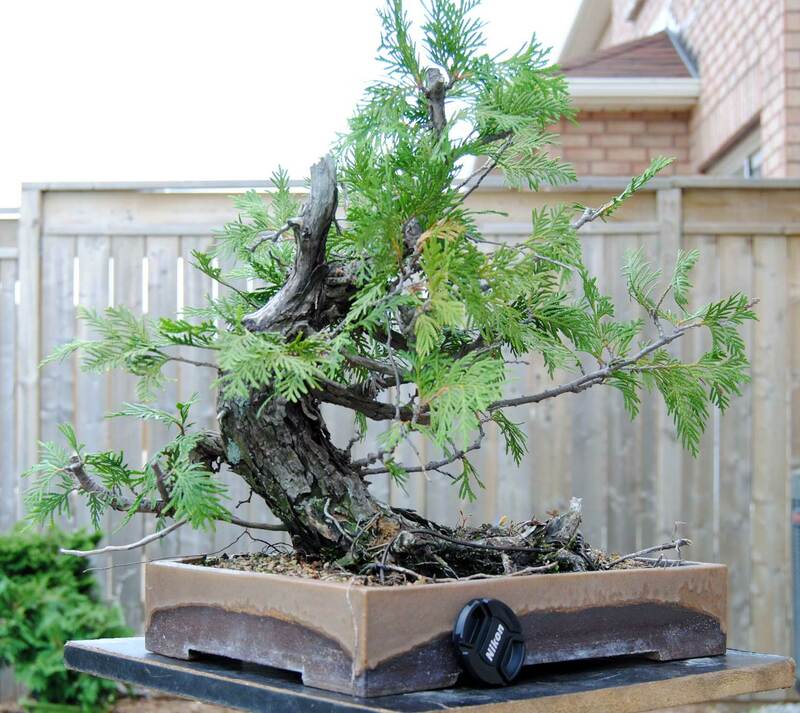 Rather than try and tell you how it is, I will instead quote Toronto bonsai veteran Reiner Goebel, who has several decades more experience with Thuja occidentalis than I do. One of my bonsai teachers also puts it well: “Decide which foliage the cedar will lose, or it will decide for you”. As Reiner says, it is usually the older interior foliage which is shed – yet this is probably the foliage you want to keep. So pruning generally involves shortening the strong fronds at the tips of branches and those strong ones jutting off the sides. Strong “runner shoots” that often appear sticking straight up at the crotches of branches should also be removed. 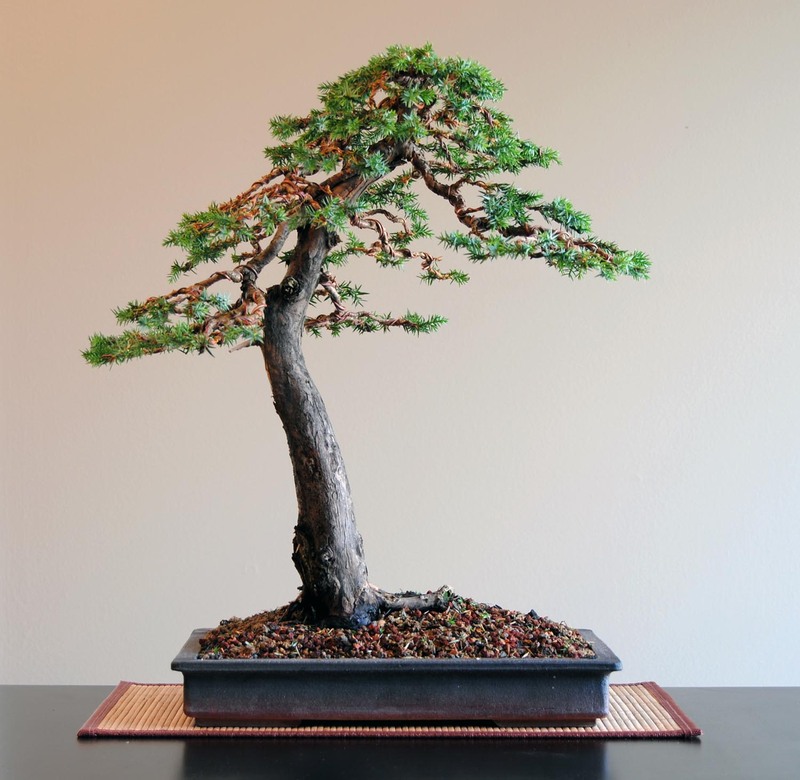 This is especially important on collected cedars that are early in their training, since interior foliage is usually sparse and weak (if it exists at all). Late summer cutting helps the tree hang on to that stuff so it has a better chance of gaining interior strength the next year. 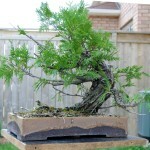 This tree serves as an example, a small Thuja collected in Spring 2012. It has been slow to find its legs and is still not at full throttle, but this pruning is necessary to maintain the precious interior growth. Last year it was not pruned at all. Only Thuja that show exceptional growth following spring collection should be summer pruned during their first year of captivity. In the first few years post-collection, August pruning may be the only cutting that a Thuja will get, while the rest of the year is spent developing a foliage mass. 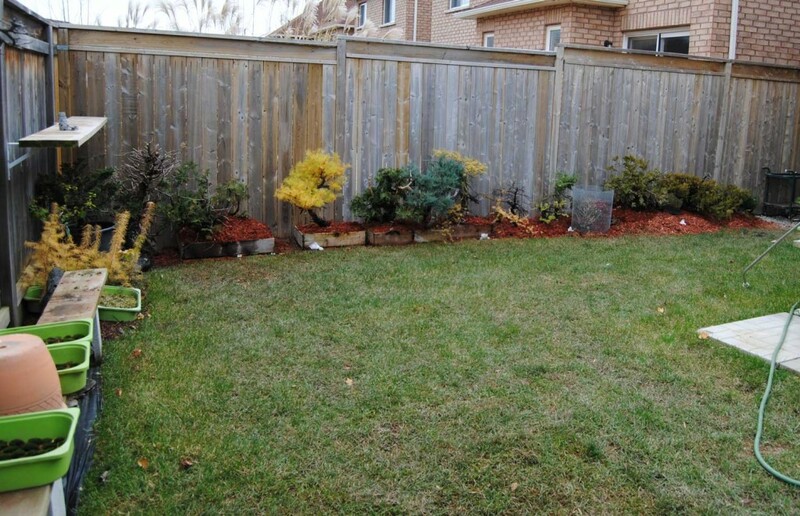 Healthy cedars, like junipers, grow all year and require several pruning sessions. 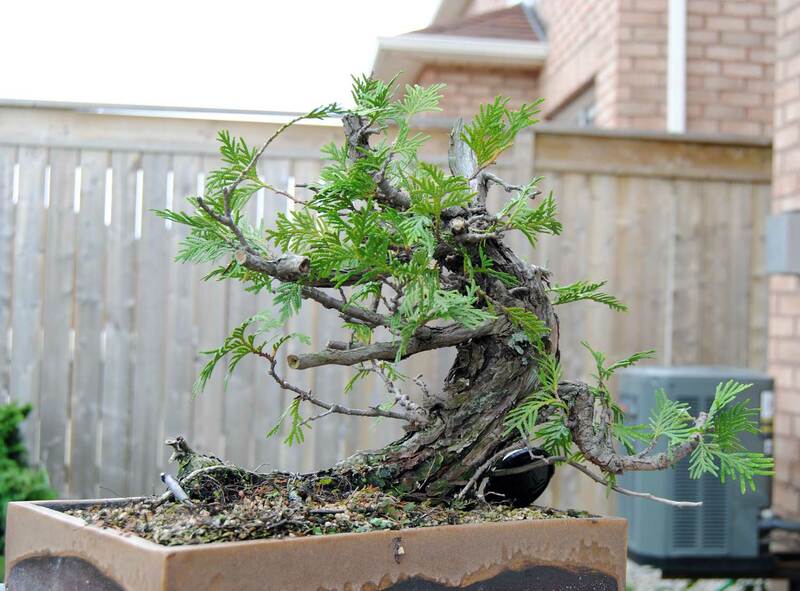 Blaauw’s juniper is a variety of J. chinensis that has foliage very similar to Shimpaku, except it is a deeper blue-green when healthy. Blaauw’s (often called “Blaauwi” around here) used to be very popular in Toronto as a shimpaku substitute because they were readily available in nurseries as single trunked specimens. This was well before my time. I have never seen a nice single trunked Blaauw in a nursery. Blaauw in general is quite rare to see in nurseries these days, presumably having gone out of fashion in the landscape trade. 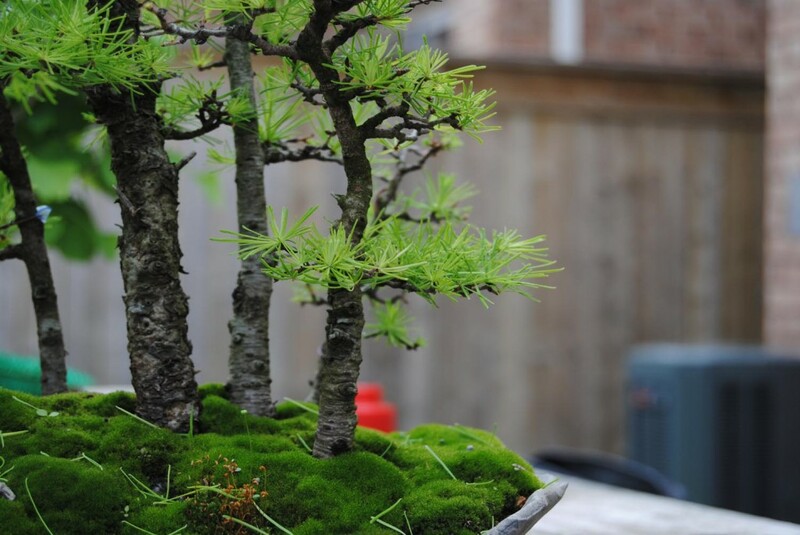 Nevertheless, some impressive Blaauw’s juniper bonsai survive today as reminders of “the old days” of Toronto bonsai, the most highly regarded one being this Blaauw forest by retired-from-bonsai-artist Bob Wilcox. 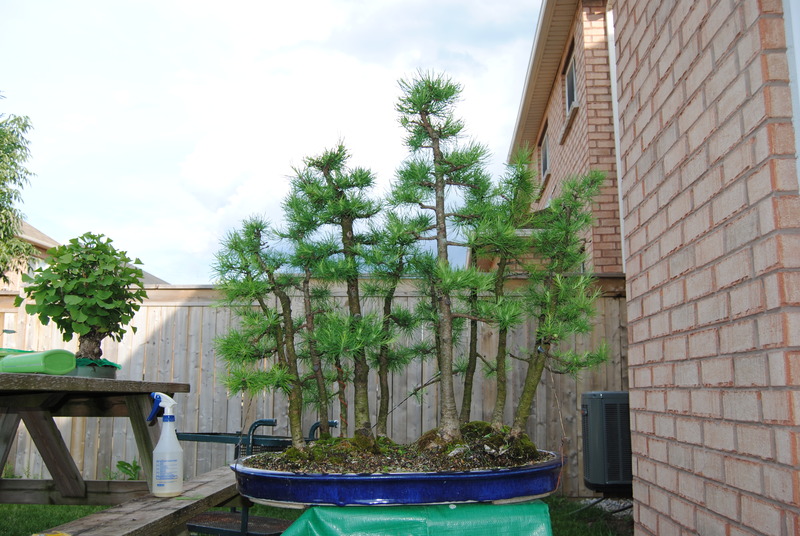 This raft style Blaauw was gifted to me this spring by a good friend who is one of the matriarch’s of bonsai in Ontario. She created it something like 20 years ago from a discarded workshop tree after the student had cut all the branches off one side in an effort to make a bonsai. 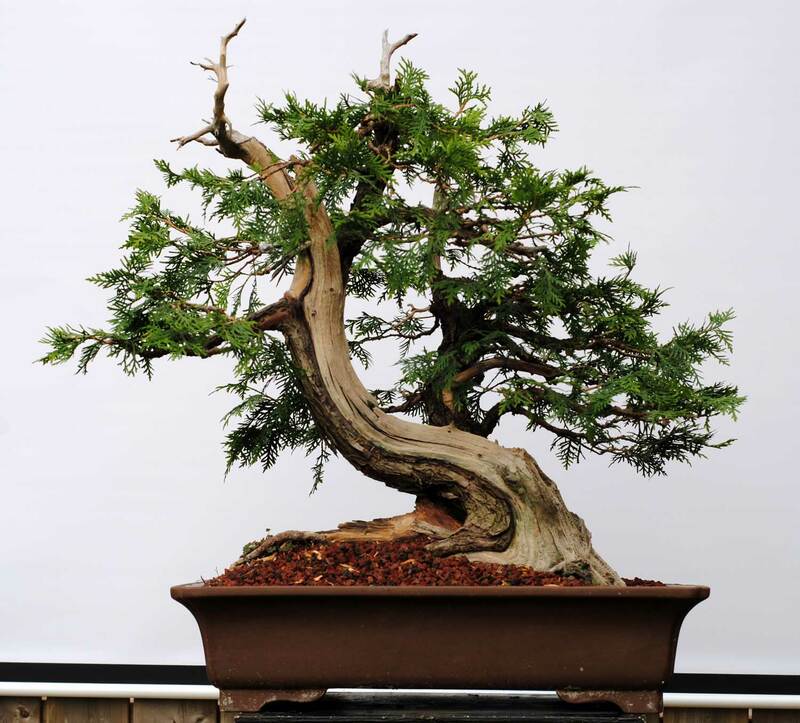 Raft plantings, like Blaauw’s juniper, are another thing that used to be very popular with the previous generation of bonsai artists, but have seemingly gone out of fashion. 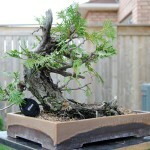 Anyone who has a juniper knows that they are a lot of work. When you have eleven trunks growing in one pot, it is about eleven times more work. The amount of work involved in cutting and wiring this tree is the main reason it was passed on to me. When I received it back in May, it was obvious there were some health issues. The trunks on the right were turning that grey-yellow colour that you never want to see in a juniper. I decided the problem was related to the poorly draining soil the tree was in, so I immediately bare rooted it with the garden hose and planted it in a coarse inorganic mix of lava rock and haydite. The tree as I received it, showing the weak right side and the mucky soil mix. By August, the group had regained quite a bit of strength and the colour had returned to the trunks on the right. So it was ready for some desperately needed thinning. 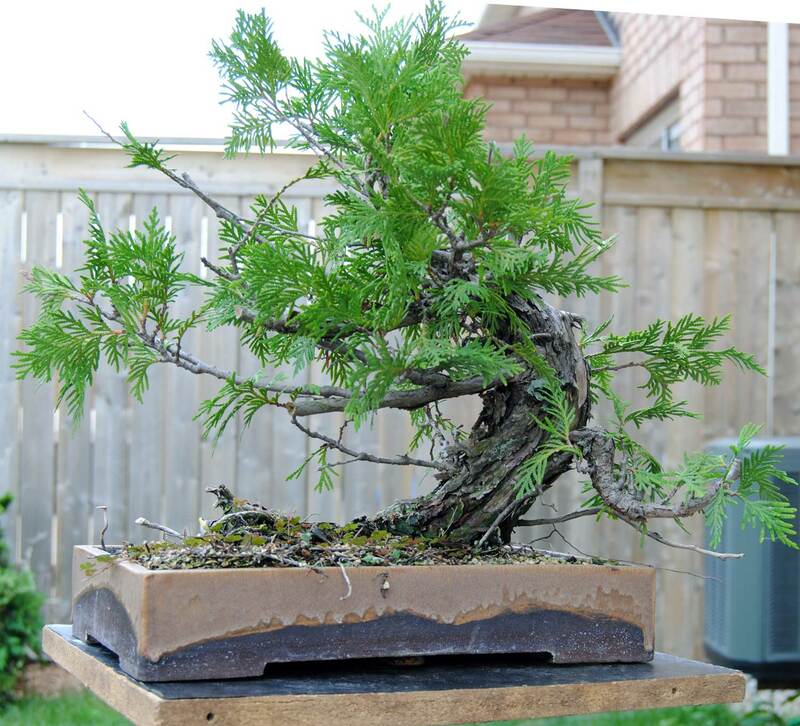 This juniper was not paid much attention over the last few years except for the occasional pinching. As a result, there were masses of foliage growing from the crotches and in some cases 4-5 branches emerging from the same point. I went over the whole tree, removing all the foliage from the crotches and simplifying the ramification to two branches at each branch point. This process took approximately 3 hours. One of the trunks on the right was still recovering, so I hardly touched it. 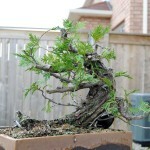 Removing foliage is probably the worst thing you can do to a weak juniper. I will let the branches elongate more because to my eye they are too short and stubby. I anticipate that next summer it will be thinned again, then detail wired. The design of this group is quite unique, with the largest trunk being almost on the outside of the planting. It is certainly unorthodox as far as forest planting design goes, but I like the directionality of the trunks, as well as the gentle movement that was wired into them many years ago. I would also like to restore the original planting position which was lost when I did the horticultural repot this spring. 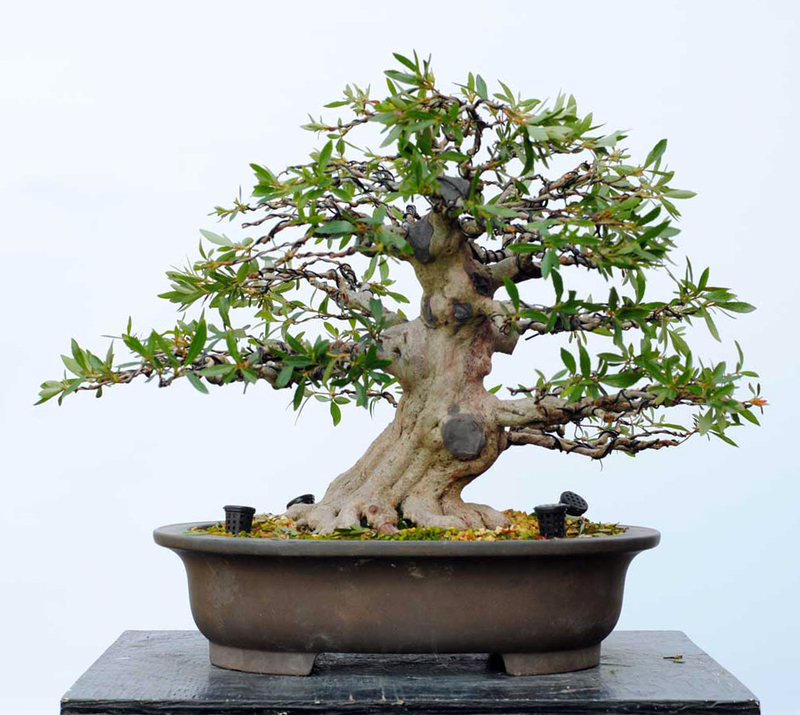 I think with the right container (ideally a stone slab) and lots of wire, this retro bonsai will one day shine again. Worked on over the last couple of days. 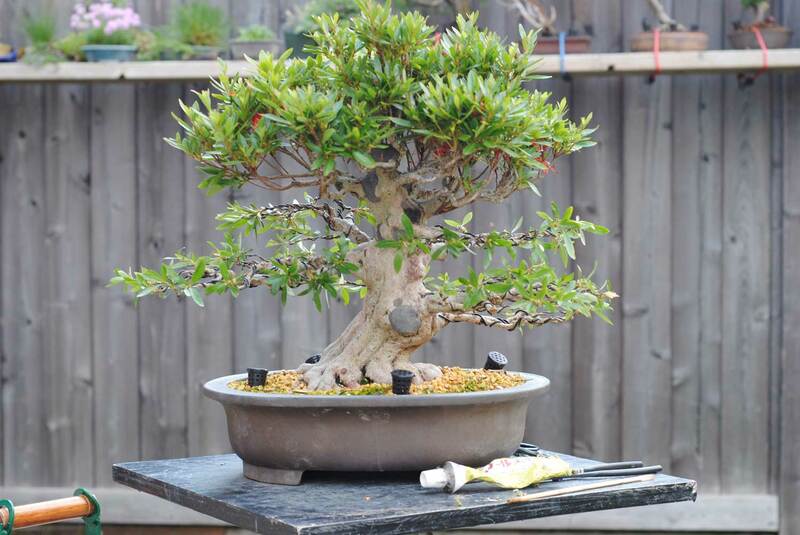 I always preach about growing species that are suited to your climate because it makes bonsai so much simpler and less stressful. For this reason I have never had a satsuki because they require quite a bit of winter protection around here i.e. garage or coldframe. Nevertheless, the opportunity recently came up to buy a Satsuki Azalea ‘Kaho’ for a great price, and I really couldn’t turn it down. This tree has been neglected for quite a few years. It is completely overgrown, with no interior growth and lots of interior dieback (although fortunately none of the branches are dead). 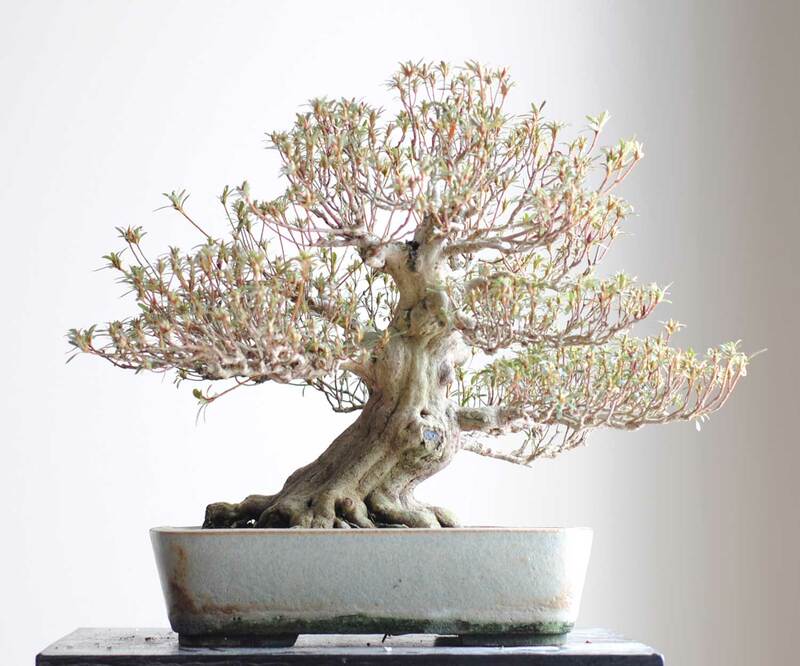 However, it has a great nebari and good branch placement. These characteristics make it worth spending a few years rehabilitating this tree. Azaleas are perfect for this type of project because they backbud profusely and grow quickly (or so I hear). This year there is one goal for this tree: get backbuds. As soon as I got the tree I spent some time removing the old flowers just to examine it in detail. Then, I thinned it out heavily, leaving just one bud at each branch tip. 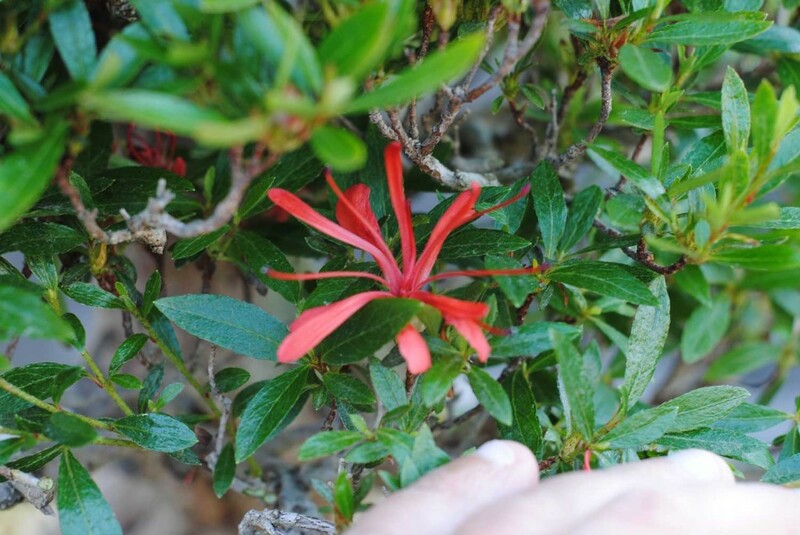 The apex was thinned less heavily because I have been told that azaleas are generally weaker in the apex – a very unusual characteristic but perhaps not surprising since this is a shrub in nature. All dead interior growth was removed. Ideally the branches would have been cut back to stumps (secondary branching), but this is probably not the best time of year and I am skeptical about the vigour of this particular tree so I felt it not worth the risk. Next year it will be barerooted, planted in kanuma, and cut back much harder. The tree is now getting blasted with full sun and fertilizer. This work was done under two weeks ago, and I’ve just noticed that new buds have started popping in the interior of the tree much closer to the trunk. As purchased. The shapely Yamaaki pot was a bonus. After thinning but before removing all the dead twigs. This picture shows how much interior dieback there was. Literally, there was only green on the very tips of the branches. Completed work for the season. This work was done just under 2 weeks ago, and new buds are now popping in the interior of the branches. 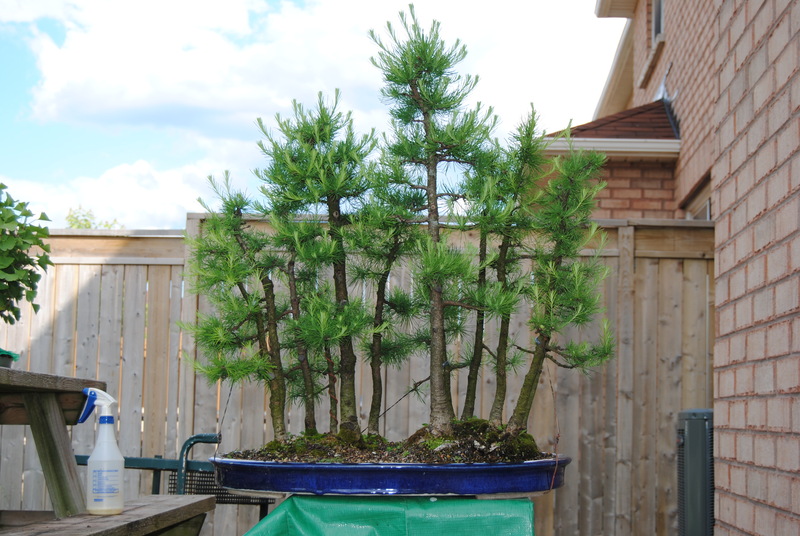 This larch forest has been mine for less than a year and needs work in several areas: 1) pot selection, 2) positioning of trunks, 3) secondary branch structure. All of this year’s cutting will be done with branch development in mind. 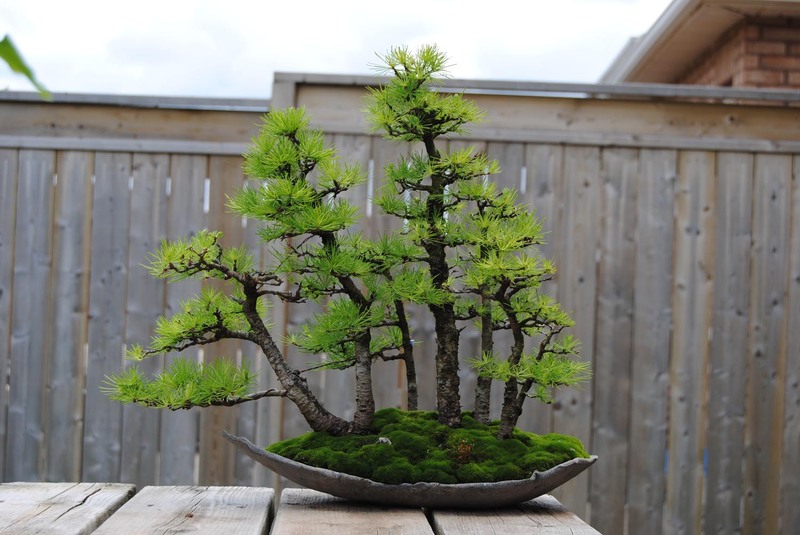 Keep in mind that larch are best appreciated in the winter, like most deciduous trees. The issues with the branch structure can be seen below. I think this larch was over-pinched i.e. new growth was completely removed resulting in stubby looking branches with very little secondary branching. This gives the branches an awkward look and leaves very little to build pads from. Pinching is useful on larch but more so for refined trees. This forest is still early in its development. Many branches on the tree need to be much longer, especially those on the outside of the forest, and in the upper areas of the tallest trunks. Pinching is counter-productive to this development. Winter image showing branch structure that leaves much to be desired. To attempt to remedy this, I have let the new growth extend into the late spring. Letting the tree grow a bit in spring leaves us something to work with. Care must be taken not to let this growth get too strong, or the branches will thicken excessively. This tree was not fertilized in the spring, but was fertilized in the week leading up to this cutting session. Instead of pinching it all off indiscriminately, I nipped back the growing tips with scissors to slow their extension and leave something that can be wired in late winter 2014. In general, strong shoots were cut back more than weak shoots. Further detailed cutting will be left for the winter when the tree is bare. A branch after cutting. New growth is not removed completely, but is instead shortened to reduce vigour and promote back budding. These new shoots will be wired next spring. After cutting. This process will probably have to be repeated once more this season. Most branches have already developed another tier of ramification which would have been lost if the new growth was all pinched off. 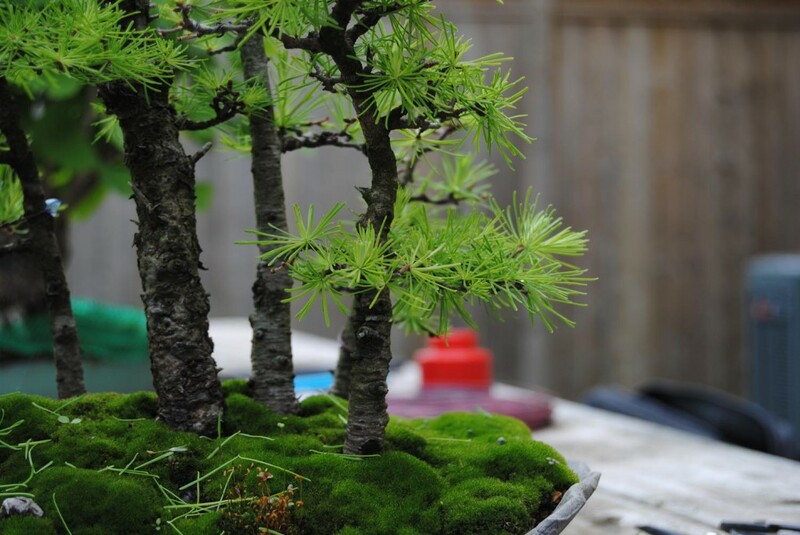 The Toronto Bonsai Society Spring Show and Sale is being held June 15 & 16 at Toronto Botanical Gardens in the Garden Hall. 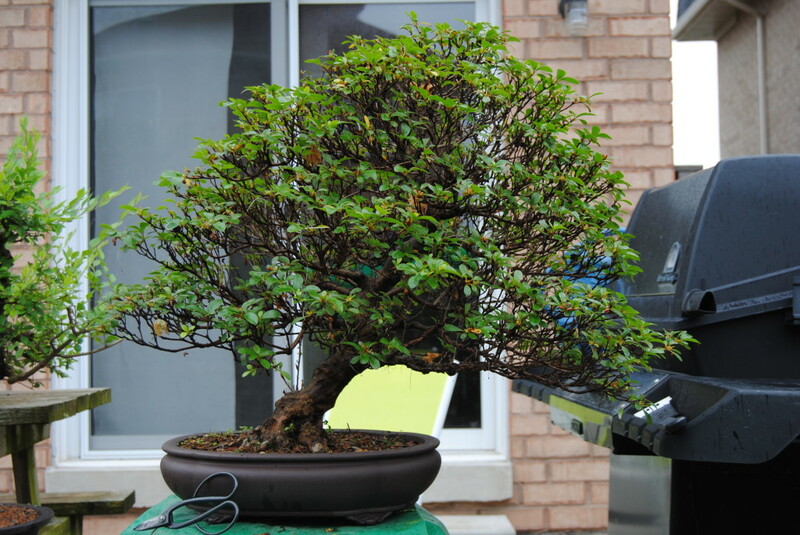 This event has been happening for decades and is surely the largest and most consistent annual exhibition of bonsai in the GTA. 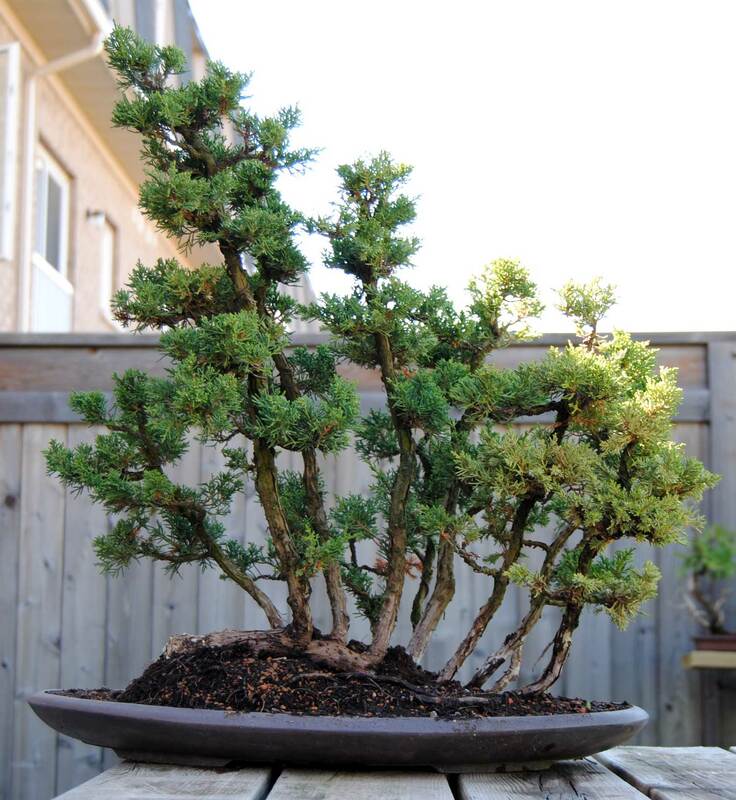 The sales tables are a great place to pick up pots, bonsai, pre-bonsai, tools, and books. 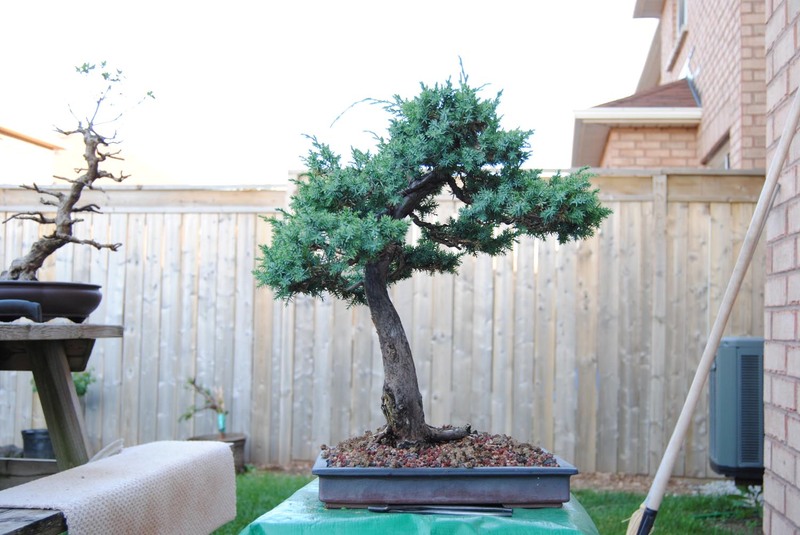 I’ve bought several trees from TBS shows/sales, including the one below which I am currently prepping for the show. 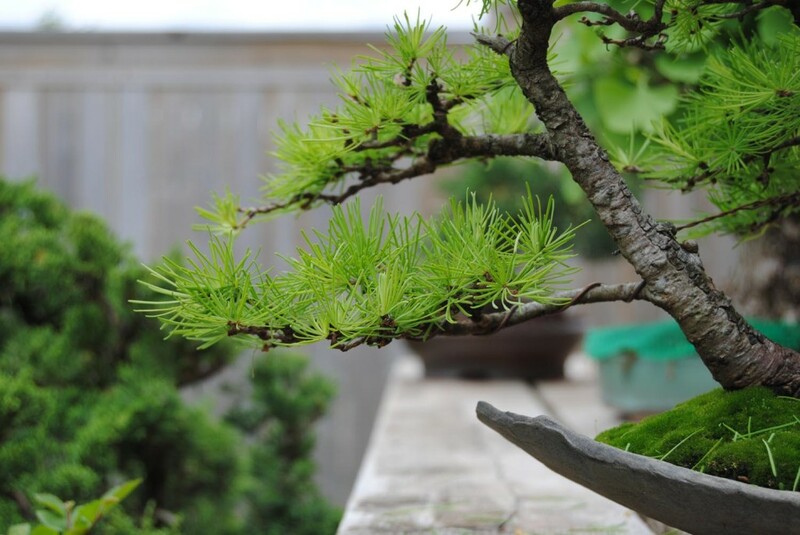 With their vigorous summer growth, larch develop needles in all sizes and all directions, and the same goes for shoots (although less-so with mature larches). 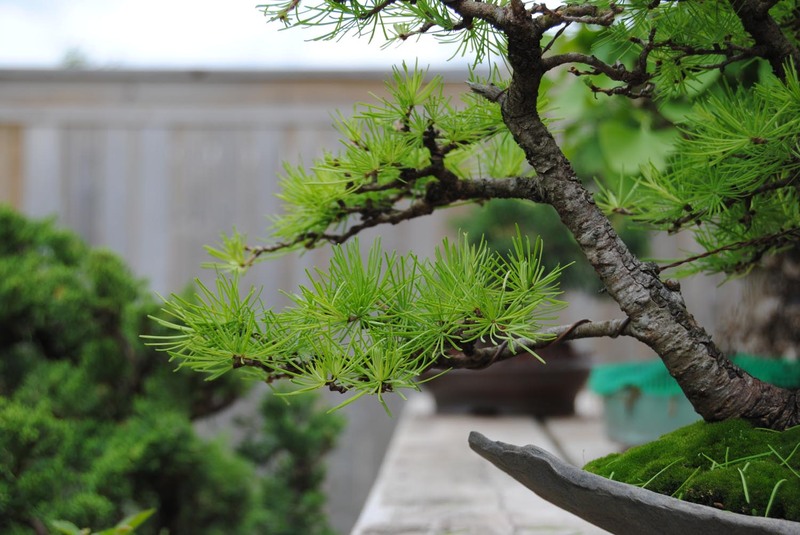 Two simple things can be done to minimize the wayward bushiness of a summer larch – reducing spring fertilization, and needle plucking. Reducing fertilization is pretty self explanatory – if you are trying to “bonsai” your larch (instead of develop the branches/trunk) don’t fertilize it until the spring growth hardens off. 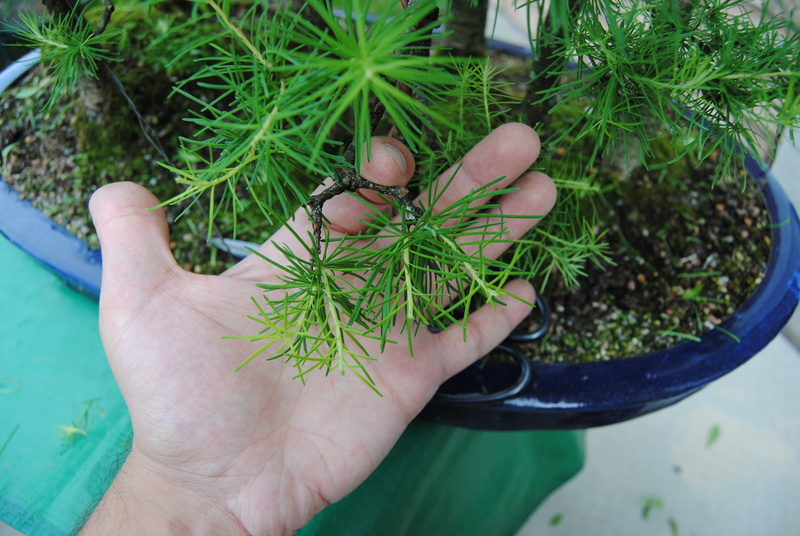 Needle plucking is self explanatory as well – try to make your larch look like a Japanese white pine. This involves plucking (by hand) all downward growing needles to clearly define the underside of the foliage pads. Downward growing buds/shoots should be cut with scissors. Excess horizontal needles can also be plucked, although be careful not to remove all the needles from a growing center. Also, needles that are growing along the branches in between buds should be plucked, although these are usually only an issue on young (1-2 year old) branches. Summer wire application on larches should be minimal unless you are something of a masochist (larch are best wired in spring as the buds start to colour up). 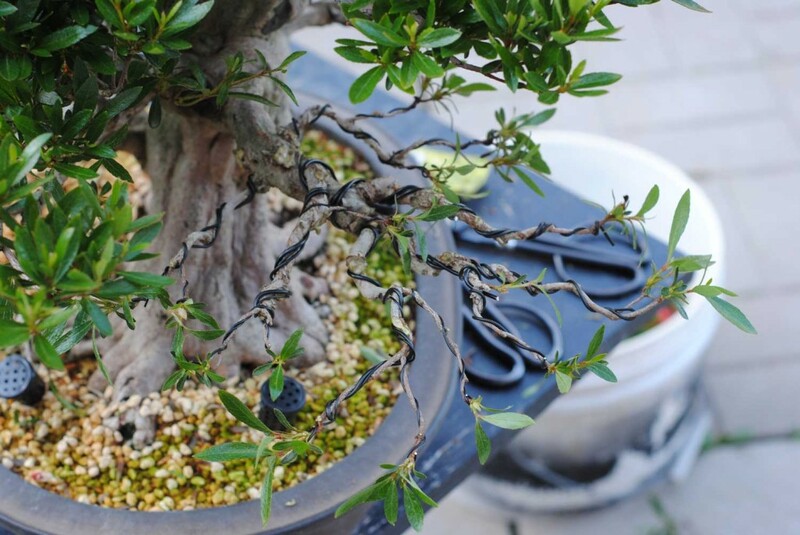 However when prepping a tree for show there is nothing wrong with wiring the odd branch, again with the goal of defining the underside of the foliage pads. Branch looking a little droopy. After minor adjustment with wire. 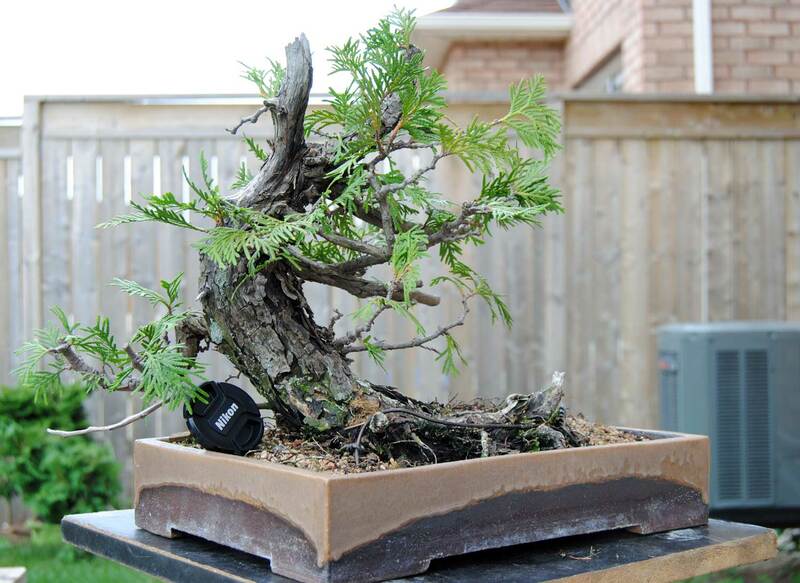 This is a Rocky Mountain Juniper (Juniperus scorpularum) that was collected in the Kootenay region of the Canadian Rockies back in 2009. Although slender it has nice movement, great deadwood details, and lots of branches. Aside from maintenance pruning and wiring down some primary branches, this tree has never been worked in detail. Today I cleaned the bark, worked on some deadwood, and cut back quite a bit of growth in preparation for its summer styling. 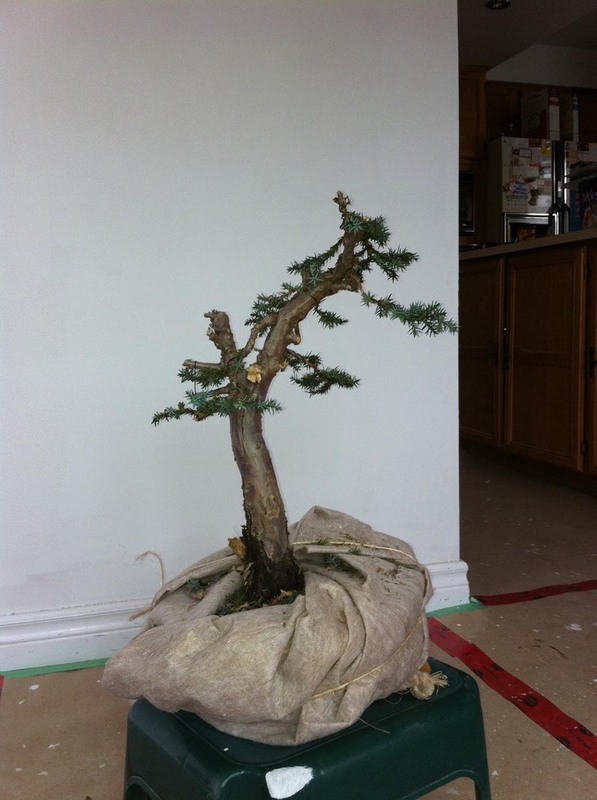 Preparing a tree for styling is almost as important as the styling itself. 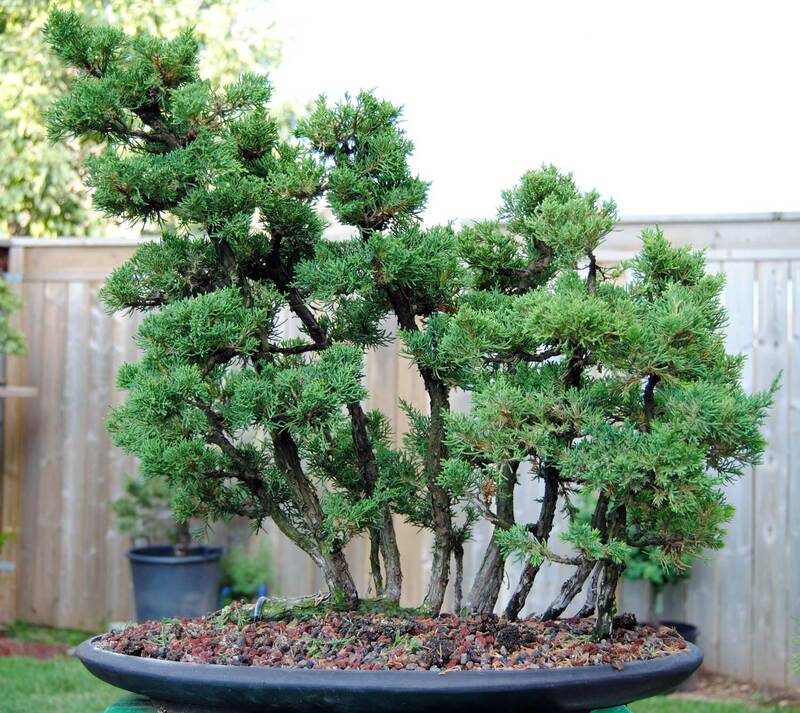 It has taken three years of cultivation and menial work to produce what is now almost a pre-bonsai. 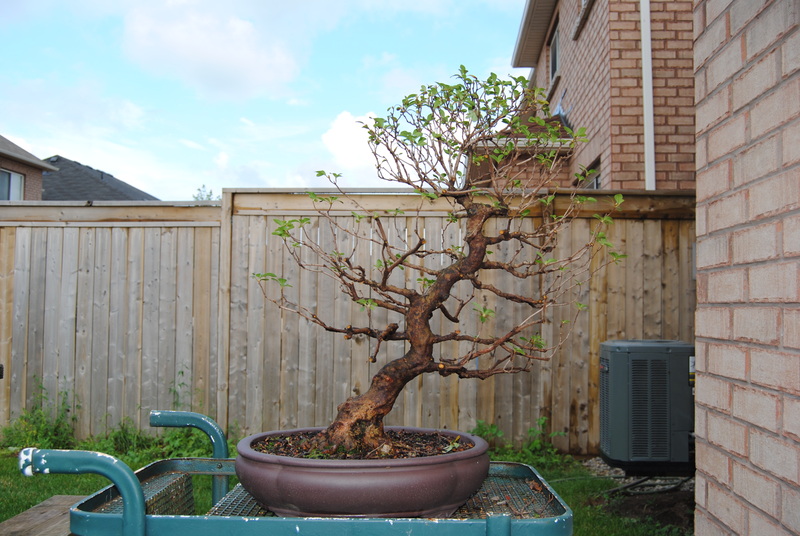 It is a long road from fresh yamadori to having something that is ready for bonsai work. In terms of styling, this tree still has me scratching my head. The main problem is that the view of the trunk with the best movement and lean does not show the lovely natural shari. I will have to make some compromises when styling this tree… either in deadwood, or trunk movement. After work. My favorite view of the trunk… but the shari is at the back. Another view showing the shari. 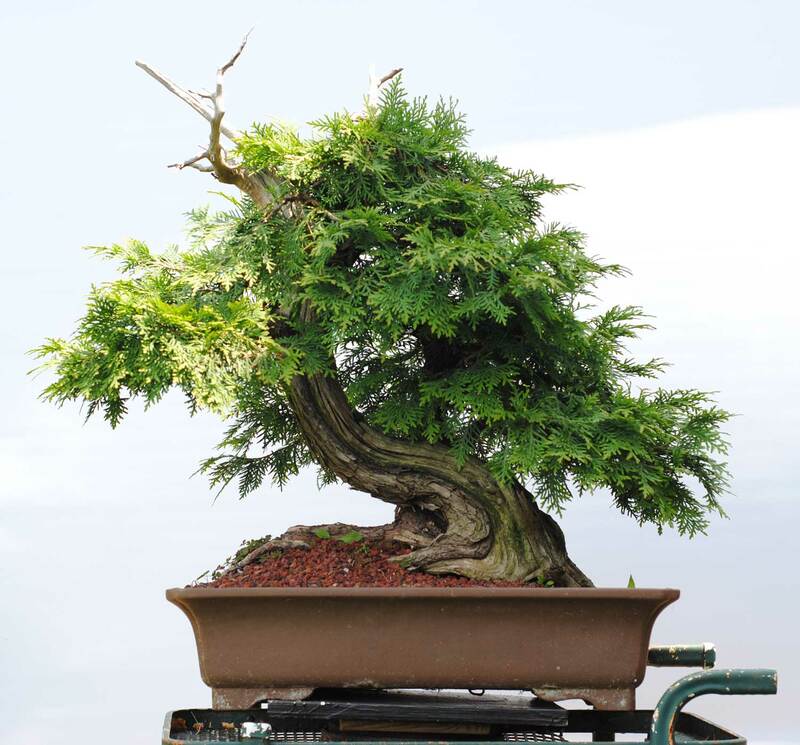 Possible front, although the top half of the tree is leaning strongly to the back.